I went out to lunch with my dad the other day, after which we took a side trip to Aldi. Dad has been telling me for years about the low prices, but truth be told, I haven't been inside an Aldi store since the turn of the century (and isn't that a fun thing to say?!). I was surprised, when I got there, at the ample amount of fresh produce they had, and at shockingly low prices. I got two pounds of fresh strawberries to make a batch of Strawberry Margarita Jam at $.99/pound, a three-pack of jalapeños, a bag of avocados, a beautiful bunch of cilantro, and a large bag of the loveliest asparagus I think I have ever seen. Considering my cart was full and I carted out three bags of groceries, I wasn't expecting to get change back from my twenty. I ended up with more asparagus than I expected, so had to dig through recipes, managing to unearth this one. I have no idea as to the source, but I made it for dinner last night and moaned at the deliciousness. This is restaurant quality stuff here. Plus, having done my prep work earlier in the day, including blanching the asparagus and cooking the pasta, it went together in minutes. Prepare bow tie pasta according to package directions. In 9" skillet melt butter. Add minced garlic and sauté for one minute. Stir in Parmesan cheese and soup base until blended, and then slowly stir in heavy cream, salt, and pepper. 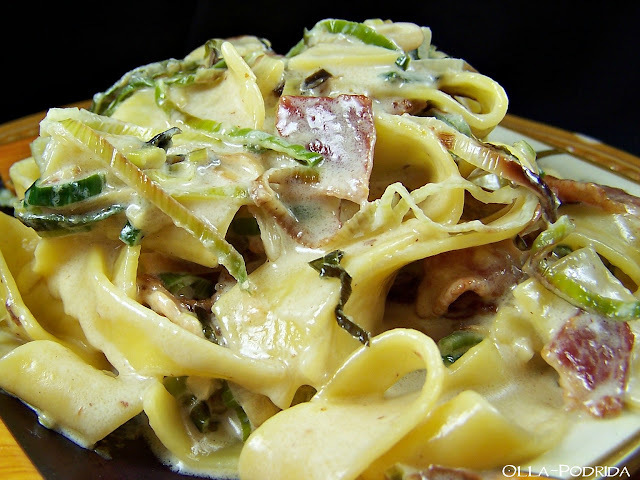 Add cooked pasta to cream sauce and toss until pasta is coated. Fold in asparagus. 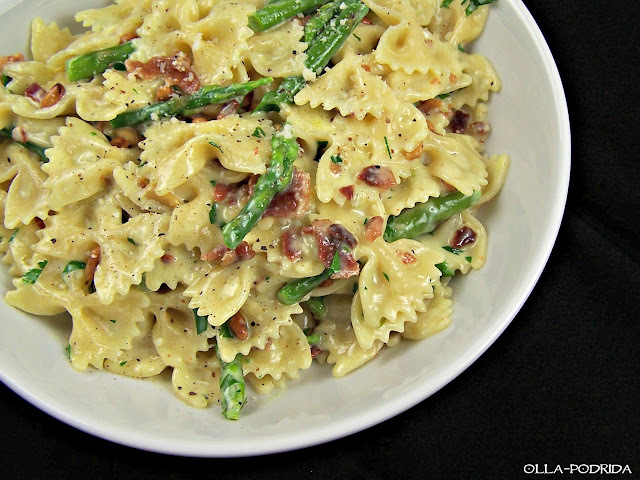 Sprinkle with bacon, pine nuts, parsley, and additional Parmesan cheese, if desired. Serve immediately. 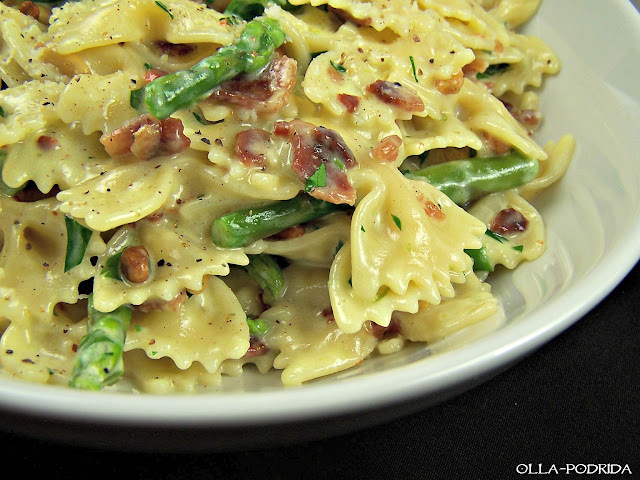 If you like this recipe, be sure to try Pappardelle with Leeks and Bacon (shown below) as well. It is SO GOOD! 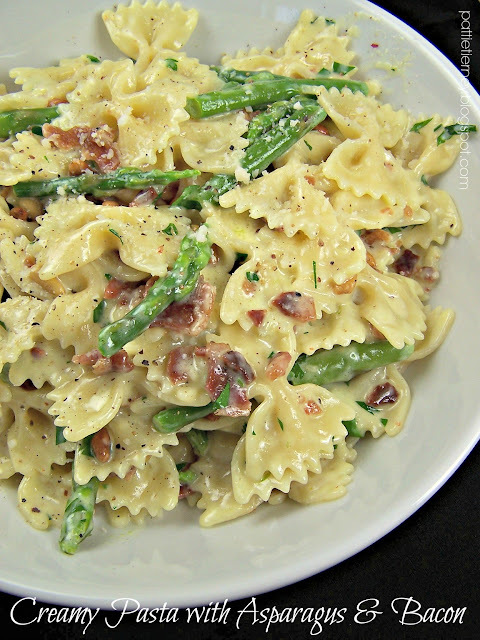 0 Response to "Creamy Pasta with Asparagus & Bacon"